Tobi very kindly donated his time and passion to contribute a tutorial for German speaking users. It covers how to trigger clips and effects in Ableton Live with a Wiimote. You can watch the videos on his YouTube channel. When I first heard of Silent Way — a plugin suite written by Os from Expert Sleepers — my first thought came to a song performed by Weather Report. The lead keyboardist, Joe Zawinul, was well known for his use of the ARP 2600. He used to have two of them, with one having the keys order inverted so he could play low and high notes together on both keyboards. 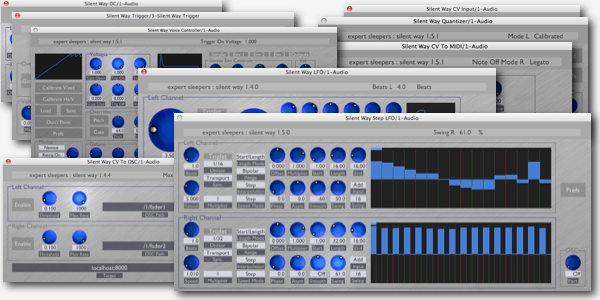 Silent Way is a suite of plug-ins designed for use as part of a modular analogue synthesiser system. The plug-ins produce no sound themselves, nor do they process sound – rather, they generate signals to be used as control voltages (CVs), which can be patched into the control inputs of oscillators, filters, VCAs etc. of an analogue system. Also, with the addition of the CV Input plug-in, it is possible to bring CVs from the synth into the computer, for recording or processing. With this in mind the relationship to Weather Report’s song became even clearer in my mind. Joe Zawinul was a notable innovator, thus naming a plugin after a song he wrote for Miles Davis in 1969 was certainly appropriate. My interpretation has changed though, I understand the name reflects the fact that these plugins are just “silent”. Using Analog Modular Synths is not always easy or convenient. First, you have to deal with calibration and fine tuning of the parameters. You have to consider that temperature can affect your settings, so playing them on stage is not really obvious. Also, there’s not a lot of solutions when it comes to using them along with modern setups involving a sequencer, plugins, MIDI or OSC. Typically you would use a CV to MIDI converter, but then loose a lot of information because MIDI’s limited data range. With some tweaking you would be certainly able to play sequences with the CV/MIDI converter, but it is not straightforward as some careful calibration is still needed. Nonetheless, even with these limitations, modular synths are still designed, produced and used. There are even pieces of music written exclusively for modular synths. So, what makes them so appealing when you know difficult they are to use? According to some people, their organic and raw response still surpasses digital signal processing based systems. But it’s not only that: there is a lot of plugins and digital workstation that sound great. Really, I think their power lies in the ability to tweak them, turn the buttons, patch some cords, do this all in “real”. Silent Way helps this analog and digital cohabitation go further thanks to its automatic calibration and tuning features. If you own a compatible audio interface, the CV/MIDI converter is not needed anymore, and the computer takes control of your modular synth, exposing its rich features to your digital audio workstation. Silent Way works both ways, your computer can control a modular synth, and a modular synth can control your computer. On his blog, Navs talks about his setup involving a Moon Modular sequencer and Logic running a virtual instrument. In his post, he shows a beautiful sequence generated by the synth which is plugged into his audio interface, acting as a soft CV bridge thank to Silent Way, then into OSCulator to process the OSC messages, and finally into Logic where the virtual instrument is hosted. It turns out this Kyma Symposium is a very good occasion to explore some ways to use OSCulator. At least I can put down my developer hat and be a musician, again. During my research I thought it would be nice to show a little demo of VDMX, a modular VJ mixing software. I actually tried several of them, that is Modul8 and Resolume. There is also Isadora which is looking very professional. it supports natively OSC, provides Bonjour discovery, and binding an OSC message to a button is as simple as saying “hello”, or “bonjour” if you will. it leverages the architecture of Mac OS X by using Quartz composition up to the max, and I like it. I’m sure VDMX developers will do wonders with the new technologies Snow Leopard offers, like Grand Central Dispatch and OpenCL. it has a reasonable price tag considering the capabilities it offers. Memo Atken is using it too. 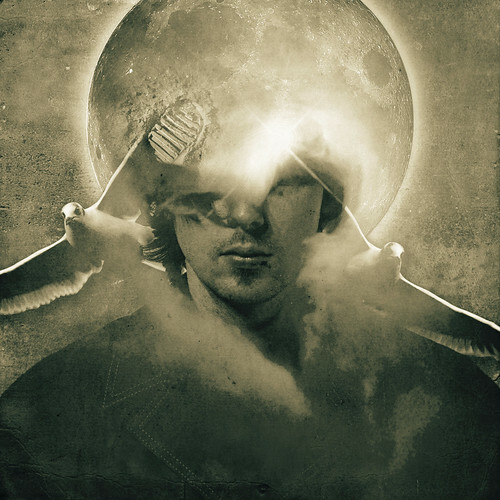 Examining his work makes no wonder he’s a extremely talented user of Photoshop, After Effects, Resolume … but he admits he’s no expert when it comes to programming OSC routings in languages like Max/MSP, Puredata or Processing. There are still some little caveats to solve however. Hopefully, the Resolume team will fix those bugs, and Martin will be able to increment his bundle to version 1.0!